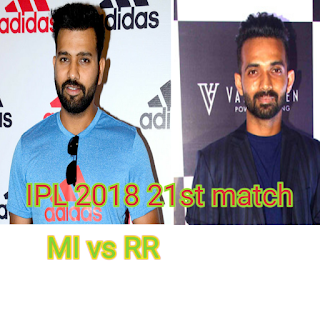 IPL 2018 21st match RR vs MI has been played in Sawai Mansingh Stadium Jaypur. Rohit Sharma captain of MI won the toss and opt to bat first. This match was so interesting and heart thrilling . In this match there are so many memorable moments. Let's start. Surya Kumar Yadav played great inning of 72 in just of 47 delivery in which he smashed 6 4s and 3 sixes. Ishan Kishan 58 of 42 delivery with 4 4s and 3 6s also played well. Polard scored 21 useful runs but other batsman couldn't do anything good for the team. Jofia Archer got 3 wickets for 22 runs. Dhawal Kulkarni 2 and Jaydev Unadkat got 1 wicket. Bowling of Archer was the turning point for Mumbai Indians inning. MI scored 167/7 in 20 overs. Sanju Samson scored 52 in 39 delivery with 4 boundary . Ben Stokes 40 and Ajinkya Rahane 14 added sum useful runs to the team total. But there was a memorable inning played by young Krishnappa Gautham. His unbelievable 33 in just of 11 delivery in which he smashed 4 boundary and 2 sixes took RR to win. RR acheived winning target of 168 in 19.4 overs. RR 168/7. The result is RR won the match by 3 wickets.